Whether you are a complete beginner or at an intermediate level we offer 1:1 kitesurfing tuition to all abilities. Just finished your course – If you have recently completed a kitesurfing course with us and need to perfect the board starts you will definitely progress with some 1:1. Purchased some new equipment – We can help set up your new equipment and make sure you are 100% satisfied with the safety systems etc. Progression – Perfect for if you prefer concentrated 1:1 tuition with an instructor by your side where the pace of learning is at your own speed. Need a refresher – Perhaps it’s been a while and it’s time to dust off the kiteboard and get back on the water. 1:1 tuition is the best way to ease yourself back into the sport without making silly mistakes. Hunstanton Watersports offer a wide range of kitesurf lessons from first time beginner to intermediate / advanced – all under the supervision of BKSA approved instructors. 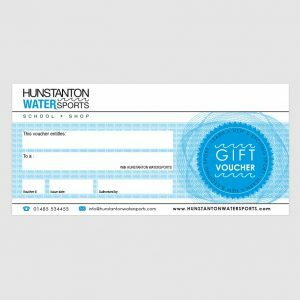 All our Kitesurf Gift Vouchers are available online so you can give the gift of kitesurfing to your friends and family. If you would like to purchase more than the minimum x2 hours, please add x2 in the cart for a total of x4 hours etc. All of our vouchers are dispatched in first class post, so you can be confident that they’ll arrive on time and ready for you to give to someone.